All quotations provided by us for Stage 1 testing are fully inclusive no matter how many 50mm samples are required (except for VAT). Although about 80% of properties pass at Stage 1 it follows that about 20% need to go for either Stage 2 Petrographic Analysis in walls and/or Stage 2 Density testing for footings. Although we make a modest charge, typically between £100 and £150, for returning to a property we do not mark up laboratory fees; such fees are charged at cost. Always check potential additional charges when seeking competitive quotations. The majority of properties in Cornwall that were built in the twentieth century were constructed from concrete blocks laid onto mass concrete foundations. 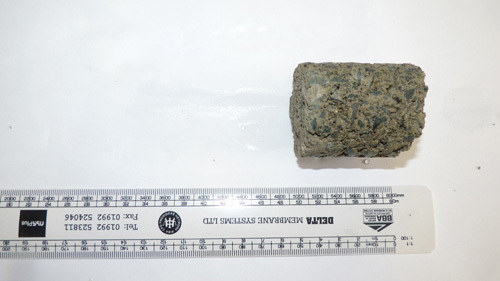 The main reason for the use of concrete blocks in this area was the non-availability of suitable raw materials to form and mould conventional red or yellow clay bricks. Blocks were produced from waste rock worked from mining, quarrying, free supplies of beach gravel and incinerator waste. The production of blocks and mass concrete using these materials generally started from the late nineteenth century until the 1950s where mass production of concrete blocks became common and widespread. The use of local materials in concrete block and foundation construction was not eradicated until around 1960. 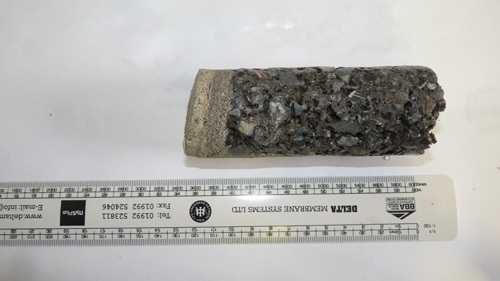 Some of these local materials used as aggregates in concrete construction can cause deterioration and mechanical weakening of the building form. Lack of cement can also cause deterioration. Often found in mine or quarried rock. These can oxidise under damp atmospheric conditions with the production of sulphuric acid. This attacks the cement causing weakness and expansion – commonly called ‘Mundic Decay’. 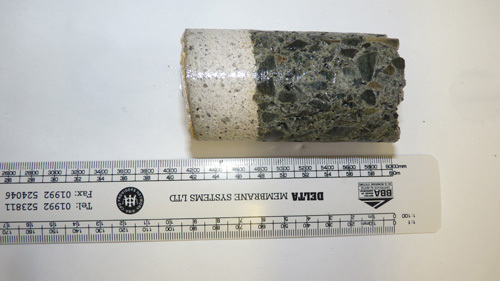 These are formed by sediments laid down on the floor of oceans and can be quite soft. They can change volume and delaminate under attack from moisture fracturing the cement of the concrete. This effect is called ‘Killas’. To establish the condition of any mass concrete and concrete blockwork within any dwelling suitable testing is required. The present screening test was developed by the Royal Institution of Chartered Surveyors through the Mundic Steering Group (Local Chartered Surveyors and Petrographers) with input by the Building Research Establishment in 1994 and revised in 1997, and identifies major problems of concrete degrading. Supplementary stage three expansion testing was introduced in 2005. 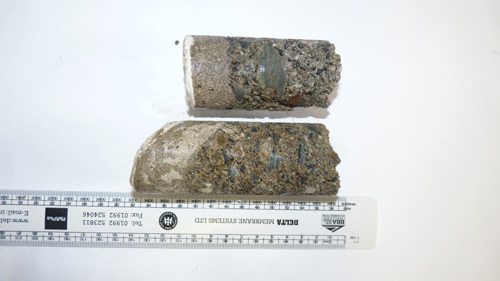 The screening involves taking a number of core samples from the concrete parts of a property which are then examined and classified by a Petrographer. 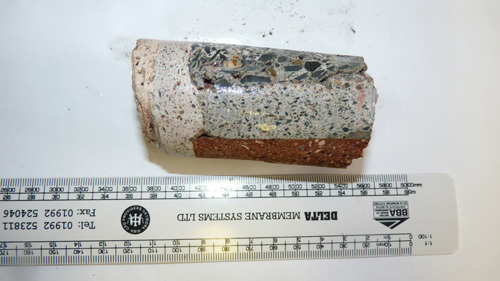 The Petrographer will determine the category that the concrete is in; see below in 2.7 Results. 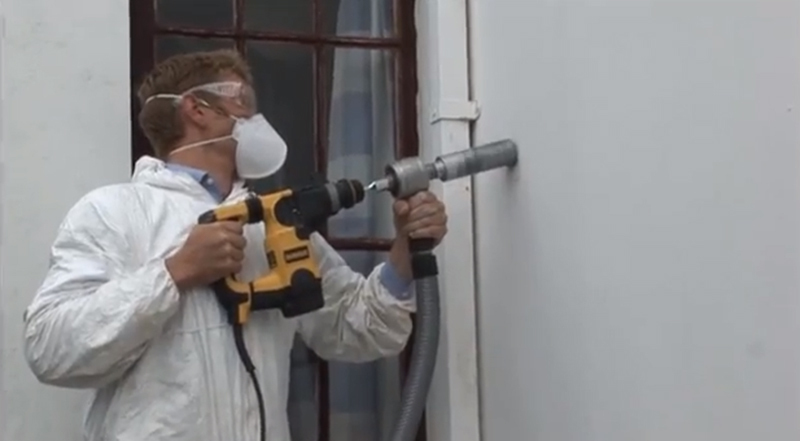 The screening test involves taking a number of 50mm diameter drill holes where a “core” is taken from the external walls, foundations, internal walls and chimneys. Approximately 80% of properties are found to have Class A sound concrete and no more action will be needed. 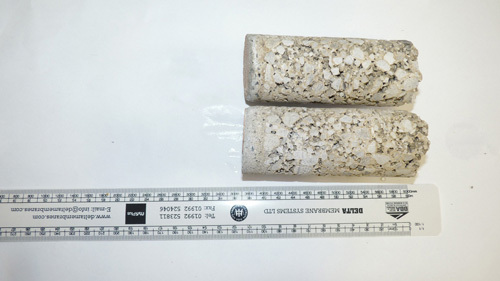 However, when concrete cannot be placed into ‘A’ or ‘C’, it is recommended that further testing be carried out and is reported as “unclassified”. There are two types of analysis a) Stage 2 Density (where a 75mm core will need to be taken) and b) Stage 2 Petrographic Testing (where thin slices of core samples previously taken are mounted on slides for examination under a microscope). Either examination will identify and classify results to determine Classes ‘A/B’ or ‘B’. This examination will assess the performance of the aggregate material. 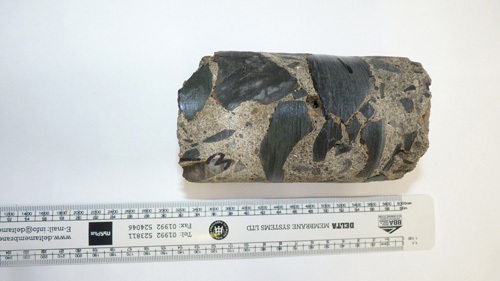 To this end a number of 75mm core samples will need to be taken. It can be applied to ‘Class B’ material following the stage two investigation when, in the opinion of the Surveyor and the Petrographer, they are satisfied that the property’s structural condition and examined core material do not indicate visible deterioration. 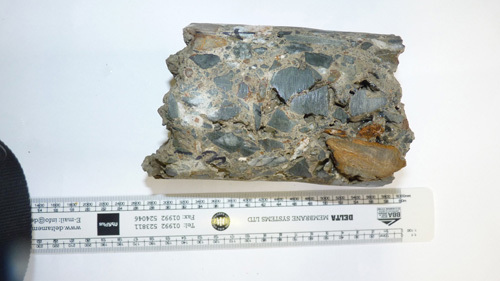 Tests are carried out in laboratory conditions to simulate extreme weathering. Current statistics indicate that 60% of properties prove successful when subjected to this examination. Successful results are reclassified as ‘Class A/B’. Class A – Sound concrete satisfactory condition. Class A/B – Concrete considered sound subject to adequate protection and maintenance. Class C – Those are found to be clearly unsound from examination. Class A1 (formerly Class A) – Sound concrete satisfactory condition. 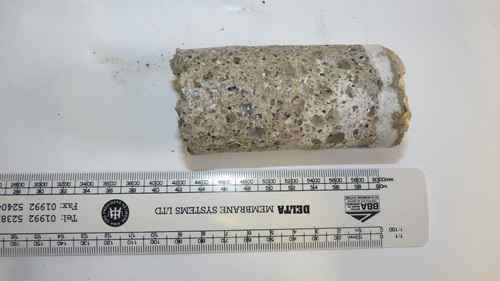 Class A2 (formerly Class A/B) – Concrete considered sound subject to adequate protection and maintenance. Class A3 (new classification) – The development of a Stage 3 Expansion Testing that was formerly designated as Class B, would have formerly been classified as Class A/B but will now be designated as A3. Class B (unchanged) – Concrete contains more than 30% possible problem aggregates although appearing sound could cause potential problems. Class C (unchanged) – Those that are found to be clearly unsound from examination. A large number of properties have been examined and the results indicate some 80% have passed in Class A (A1 after September 2015) at the preliminary screening stage; about 5% have gone to Class C. The remaining 15% have undergone Stage 2 examination and many have been regraded Class A/B (A2 from September 2015). A small number will also be regraded to Class A/B (A3 after September 2015) after having undergone expansion testing). With Class C materials it is recommended that examination be made by a Structural or Civil Engineer. It is important that reports are assigned on every change of ownership so that there is a contract between the original testing Chartered Surveyor/Company of Chartered Surveyors and the Owner. However, if the Chartered Surveyor/Company of Chartered Surveyors have ceased trading or no longer undertake Mundic Testing, then the report will not be available for assignment since the individual’s or Company’s Professional Indemnity Insurance will cease being active after the runoff which is currently the minimum of 6 years as laid down by the Royal Institution of Chartered Surveyors (RICS). Theoretically, Mundic Tests will last in perpetuity (subject to changes in guidance) but as discussed, this is reliant on the Chartered Surveyor/Company of Chartered Surveyors remaining in business or continuing to provide Mundic Testing as one of their/its services. Pelite hosted mine waste (2-2) and tailings sand (1-6). Mass concrete footings. Pelite hosted mine waste (2-2). Mass concrete footings. 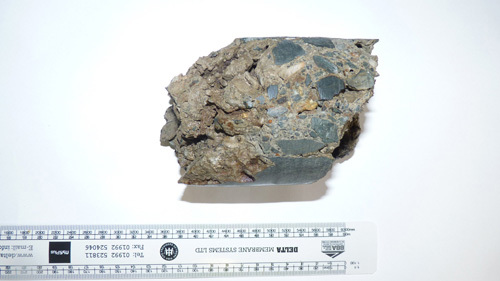 China clay waste (1-1). Concrete block. Pelite hosted mine waste (2-2). Concrete block. Slate (1-6). Concrete block + red brick. Penlee quarry dolerite. Concrete block. Natural hyaline pumice (1-6). Concrete block. East Cornwall dolerite (1-3). Concrete block. Grey and white limestone (1-6). Concrete block. Granite-hosted mine waste (1-6) and beach sand (1-5). Concrete block. Fine-grained granite (1-2). Concrete block.